Here's a story people want to be told. And though timeless, it smacks of just the right stuff for just this moment in American history. Engaging at every turn, never stagnant, never dull for the full 2.5 hours. It's the kind of film that looks "Million Dollar Baby" straight in the eye and walks staight into the ring with it anyway. Yes, it tends toward the schmaltzy and hokey. And yes, director Ron Howard is not ashamed of being manipulative. But, it is based on a true American story and beats with a heart as big as a boxing glove. Shot beautifully with a darkened look, this color film has the feel of black and white, appropriate for the depression era story it dramatizes. Russell Crowe, as he did with "Gladiator," gives the film an underdog hero you will love to root for. Paul Giamatti delivers an outstanding performance as his fast-talking trainer/manager. Renee Zellweger has done such interesting roles in the past few years, this feels like a step backward for her as the "supportive wife." That said, she's perfectly fine. But it's really the direction and endearing story that will keep you at the edge of your seat, the edge of a cheer, the edge of a tear. It's good to be reminded that America has made it through tough times in the past. It is good to see such a role model for integrity up on the screen again. 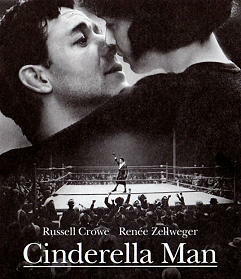 Cinderella Man. Copyright © 2005. Starring Russell Crowe, Renee Zellweger, Paul Giamatti, Craig Bierko, Paddy Considine, Bruce McGill. Screenplay by Cliff Hollingsworth, Akiva Goldsman. Produced by Brian Grazer, Ron Howard, Penny Marshall at Universal/Miramax/Imagine/Parkway.